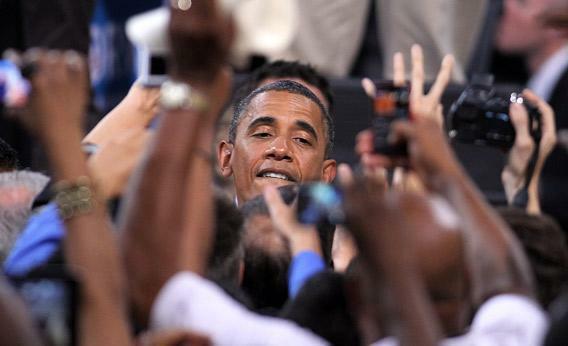 Obama’s Denver debate performance: Introverted personalities are misunderstood. But that doesn’t mean we don’t like you. Photograph by Isaac Brekken/Getty Images. When I started a new job at a newspaper in the late 1990s, I noticed that one of my editors had four seemingly random letters taped above her computer monitor. “That’s my type,” she explained, and said that I’d soon have my own. Sure enough, after a few weeks human resources herded all the new employees into a conference room and made us fill out a Myers-Briggs personality test. My results showed that I was an almost off-the-scale introvert, which shocked a lot of my colleagues. Because being a reporter required me to interact with people all day long, and because I had taught myself to be outspoken and gregarious in order to do my job, they assumed that I was an extrovert. But the “I” test result didn’t surprise me at all. I knew that big crowds could make me uncomfortable, that a day of constant interaction with sources and editors would make me crave time alone, that it was easy for me to crawl into my own head and shut out the rest of the world. But being an introvert doesn’t mean that I don’t like people. Clearly, Heilemann is not one of us, because he doesn’t seem to understand what makes me and my fellow introverts tick. But it’s a common misconception. Introverts actually make up a significant portion of the population, probably a quarter to a half, but you’d never know it (we’re quieter, after all, and it’s true that we’re often driven to pretend to be extroverts in order to fit in). Swiss psychologist Carl Jung, whose work the Myers-Briggs test is based on, first popularized the idea that the world was divided into introverts and extroverts in the 1920s. He defined extroverts as people who are energized by interacting with others. Introverts, on the other hand, are drained by conversation and crowds, hence the need for occasional time alone to recharge. Still, psychology can’t seem to completely break away from the idea that there’s something not OK about introverts. The World Health Organization classifies “introverted personality” as a potential health problem, and last year, as recounted in Psychology Today, the American Psychiatric Association considered a proposal, later dropped, for listing introversion as a contributing factor to some personality disorders. (Obama conspiracy theorists would have loved that one: Not only is our president a Kenyan, Muslim, anti-colonialist, terrorist-sympathizer—he’s nuts!) There have even been suggestions that introversion could belong on the autism spectrum, somewhere beyond Asperger’s syndrome. What is it about introverts that makes people think we’re in some way damaged? Partly, it’s a function of culture. It’s hard to imagine a society more biased against introverts than modern America. Reticence to engage in group activities is seen as a failing, even a potential sign of deeper psychological problems. (Has the phrase “he was a loner, kept to himself” ever been uttered in a positive context?) Admitting “I’m not really a people person” is enough to tank a job interview. And if you do get hired, opting to head home after work rather than hit the bar with colleagues can lead to accusations of shyness or snobbery. Wednesday night’s lackluster debate performance added to the impression that the president’s personality may get in the way of his political prowess. “Obama behaved like an introvert, and he got steamrolled by the extroverted energy of Mitt Romney,” writes Sophia Dembling, whose book The Introvert’s Way: Living a Quiet Life in a Noisy World is due out in December. Critics in the so-called chattering class (that description alone tells you it must be packed with extroverts) suggest that Obama’s reluctance to chat up congressmen or hobnob with donors has hurt his legislative agenda and cost him valuable campaign dollars. Extroverts don’t necessarily make better leaders, writes Susan Cain, author of Quiet: The Power of Introverts in a World That Can’t Stop Talking, in a recent New York Times op-ed. But they certainly have an easier time standing up to the constant exposure of modern political life. As Wednesday night showed, the president’s tendency to remain calm and low key can cut both ways: Where some observers see a cool head and quiet confidence, others perceive him as detached and coldly unemotional, cowed by a bombastic opponent—or worse yet, imperious and annoyed that he has to stand up there and explain himself to the rest of the world. If that performance costs him votes, the president might finally get the privacy we introverts all crave—four years earlier than he hopes.